How good do your Excel skills need to be? It is important to realize that Excel is probably the largest and most complex software application ever created. Hardly anybody understands how to use every Excel feature and, for almost all business users, large parts of Excel’s functionality wouldn’t even be useful. 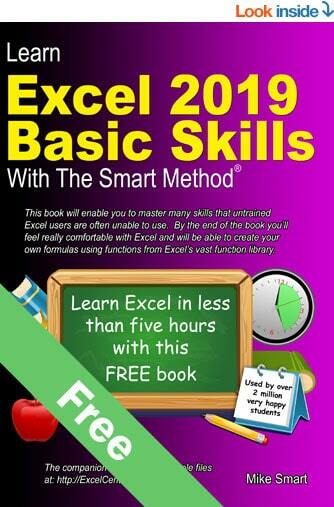 The free Basic Skills Excel Tutorial may be all you need but if you decide to further expand your Excel education you’ll be able to use the other books in this series to master even the most advanced Excel features. The free Basic Skills Excel tutorial consists of the first two sessions from our Essential Skills course and will get you started with Excel fundamentals. Even though it only teaches basic skills, you’ll still master many skills that professional Excel users are unable to use. This Basic Skills tutorial is available entirely free as an e-book. The Basic Skills course will take most users five hours or less to complete. This free e-book is also available for Excel 365, Excel 2016, Excel 2013, Excel 2010, Excel 2007, Excel 2016 for Apple Mac and Excel 2019 for Apple Mac. The Essential Skills course will give you all the skills an employer would expect. By the end of the Essential Skills course your Excel skills will be better than most office workers. Also available for Excel 365, Excel 2016, Excel 2013, Excel 2010, Excel 2007, Excel 2016 for Apple Mac and Excel 2019 for Apple Mac. After the Essential Skills course you’ll be really, really good with Excel. 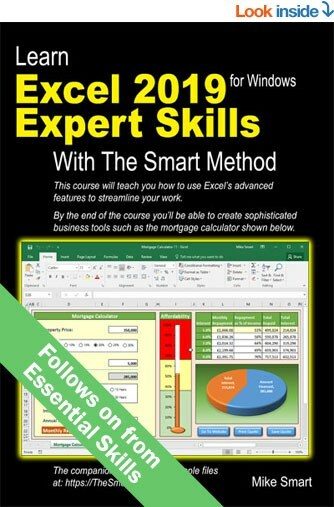 If you have completed the Essential Skills course and want to join the tiny elite of power-users who can do absolutely everything with Excel you can take the follow-on Expert Skills course and become a true Excel guru. Also available for Excel 365, Excel 2016, Excel 2013, Excel 2010, Excel 2007 Excel 2016 for Apple Mac and Excel 2019 for Apple Mac. Our acclaimed free Basic Skills Excel Tutorial is used by schools, colleges, universities and industry to train Excel fundamentals. Most students can complete this course in five hours or less. Each course has been constantly refined (during hundreds of classroom courses). This has made our courses effective for students of all ages and abilities. We have never had a student who has failed to learn Excel after taking one of our courses. 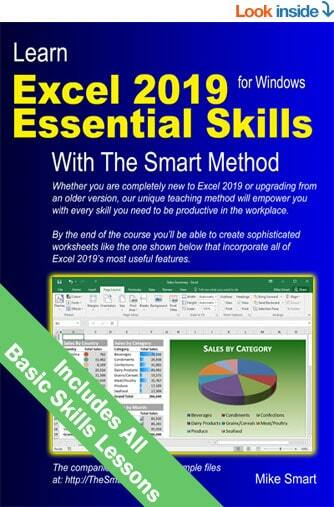 The free Basic Skills Excel Tutorial may be all you need but if you decide to further expand your Excel education you’ll be able to use the other books in this series to master even the most advanced Excel features. If you need Excel skills to get a job you should begin with the Essential Skills Excel Tutorial course (it includes all of the Basic Skills material) to reach a high level of Excel proficiency. 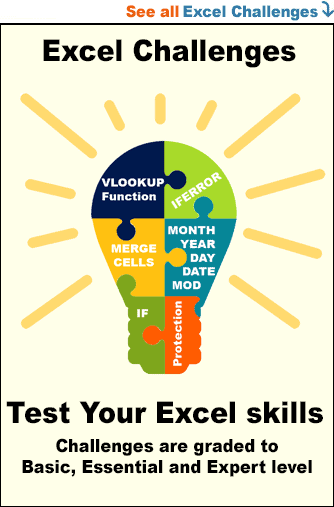 If you’re already an accomplished Excel user check out the Expert Skills Excel Tutorial to discover advanced skills that are rarely mastered (even by Excel power users). For over 900 years craftsmen have traditionally taught their skills to an apprentice. In this model the apprentice learned his trade by observing how the master craftsman used his skills. 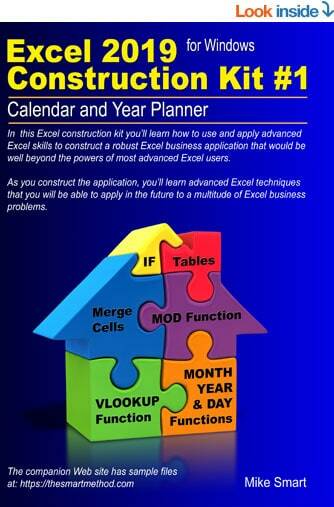 This construction kit will teach you advanced Excel skills in the same way. Even if you only have basic Excel skills, the construction kit is designed in such a way that you’ll be able to construct a complex, polished professional Excel application that would be well beyond the powers of most advanced Excel users. Our Basic, Essential and Expert tutorials all include an exercise at the end of each session. Excel Challenges go beyond simple exercises. Each challenge presents a common business problem that can be solved using Excel skills. Challenges are graded as Basic, Essential and Expert. If you have completed the relevant Excel tutorial you should have no difficulty completing each assignment. Challenges are presented completely FREE in both video and written (printable) format. This makes them ideal for both self-learners and for teachers to use in a classroom setting. Each challenge also has a solution video that walks you through a guided step-by-step solution. If you are unsure of your current skill level our challenges can help you to establish your existing Excel skill level (Basic, Essential or Expert).